If you’re like most of us, then you’re more than ready for a fresh new start in at least one area of your life. This month’s Full Moon has many supportive cosmic elements for new beginnings that it’s almost impossible to miss out on this awesome energy. It’s as if Spirit knew we are all burnt out and fried from traveling along the current pathways and have been asking for positive changes to take place in our lives. For many of us who have been feeling this way, it’s as if our prayers have been answered. Well not only have they been answered, but if we were to carefully write down our intentions and map out our plans for the next 6-12 months, we quite possibly will see our desires and intentions manifest before our very own eyes. Here’s an important reminder, it is imperative that we be proactive in our lives with our intentions. To sit back and wait for the gravy trains to roll in is a sure fire way of killing our manifestations before they even take form. If we haven’t achieved something in our lives, chances there are some steps that we must take to put ourselves in vibrational alignment with. This means doing our own soul work and addressing each obstacle that comes our way and doing our very best to dissolve these obstacles as a result of being proactive and healing what needs healing. 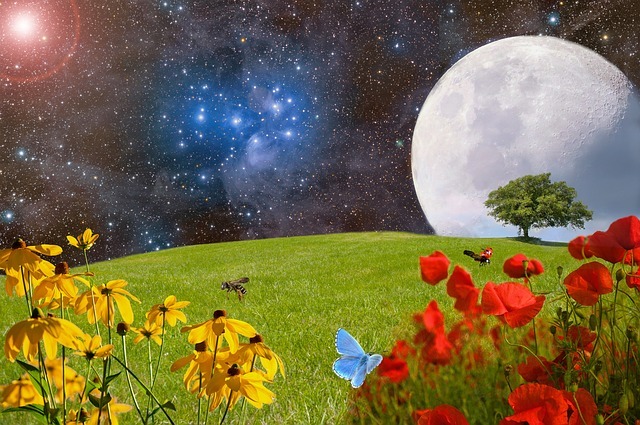 March’s Full Moon will take place on Wednesday, March 20th 9:43pm EST and as I mentioned earlier there are quite a few supportive cosmic events that assist with creating new beginnings. What are the cosmic influences? How about these? Within a couple of day’s time we will be encountering; a Full Moon in Libra at 0 degrees, a Super Moon, Spring Equinox and Sun sign in Aries! What does all of this mean? Don’t worry, I’m going to break it all down for you. Super Moon ~ A Super Moon occurs when the moon’s perigee is at its closest when orbiting the Earth. Translated – During its orbit, the Moon is very close to the Earth causing it to appear larger than normal. Super Moons heighten our emotional sensitivity. Don’t be surprised if you and those around you are a bit touchy. The benefit to this phenomenon is that hidden or unexpressed emotions will come to the surface. What has been hidden emotionally will have the opportunity to be acknowledged, dealt with, and hopefully addressed and shifted. Full Moon in Libra at 0 Degrees ~ A Full Moon is when the cycle of the moon when it is at its full illumination and strength. An excellent time to make moon water and to put your crystals and healing tools out to recharge with the moon’s energy. The energy is so strong it affects people’s moods, the tides, and the animal kingdom. This Full Moon is in the sign of Libra at 0 Degrees so we can expect a balancing within our relationships that is either going to make them or break them. When a sign is at 0 Degrees it is at the beginning stages or starting a new journey with fresh new eyes and perspectives. Spring Equinox ~ Usually the Spring Equinox is around March 21st for the northern hemisphere. It’s the time of the year when new cycles begin and all creatures give birth to new beginnings. Mercury Retrograde ~ We don’t want to overlook the fact that the planet Mercury went retrograde on March 5th and will go direct on March 28th. Mercury is providing us with the opportunity to be clear with our communication skills with ourselves and others. It is a time of re-revisiting, redoing, revamping, and repairing all of the details ahead of time so that we don’t have to start over with our intentions. Sun Sign in Aries ~ We are now moving into the first sign of the zodiac, Aries. Aries is the trailblazer and has the confidence and healthy ego to get out there and to GO FOR IT! Our relationships are going to be put to the test to see if they can withstand the test of time and pressure. There may be a few endings and there will most certainly be a few new relationships that will be formed. Communication may be a little off due to Mercury being retrograde. Emotions and tempers may flare up due to the Super Moon and Full Moon. New psychic gifts will be coming in because of the new cycles that we are stepping into. Spirit will be the judge and jury of what is and isn’t balanced in your life. Be ready for some surprises here as some situations may be phased out only for your highest and best good. Be mindful of Aries’ tendency to be over-confident. Keep that ego in check. Be flexible and keep your faith and trust strong. Say what you mean and mean what you say with love, integrity, and honesty of course. Take your time with planting your seeds and make sure you really truly are clear with your goals. Do your soul work and first and foremost be honest with yourself. Schedule some spiritual healing pampering for yourself, maybe a Reiki session or a massage. Keep up with your meditation practice of meditating at least 2x’s a week. Libra is a peacemaker so this moon should bring about resolution and healthy closure for you. Libra seeks balance in all areas of our lives and Aries will bring out the ego and our job is to find balance and harmony between both. It’s quite possible that we may see some people becoming more selfish and in some cases this is needed and in others, it may be too much for us to engage in these one-sided relationships. The old paradigm of relationships will be coming to an end due to the evolutionary shift of the planet and collective consciousness. Spirit suggests that we all do our part, our own soul work, and live our lives as if each and every word, thought, relationship, deed, and experience matters because it does.